I never knew it was possible to feel so energized and so exhausted at the same time. I just returned home from the General Assembly (#nolaga) and the International Lion of Judah Conference (#ilojc) in New Orleans, LA. Emily Scheinberg, JWA’s Assistant Director of Educational Outreach, and I spent three fabulous days in New Orleans (or NOLA) making connections, sharing stories, talking about Living the Legacy and “On the Map,” and enjoying outstanding local cuisine. 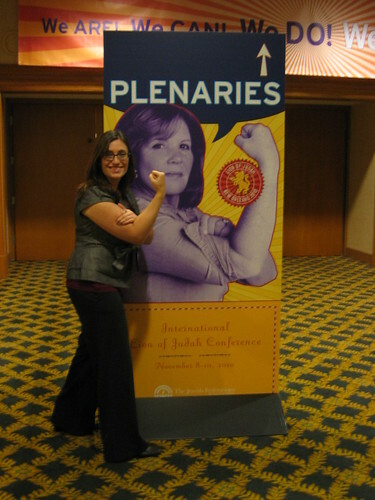 At the General Assembly, Emily and I talked our butts off. We enjoyed meeting with Federation leaders, educators, innovators, community leaders and social media aficionados. We tapped into a deeply motivated community with the Jewish Social Justice Roundtable (a consortium of organizations working on social justice projects) and shared the launch of Living the Legacy, our new social justice curriculum on Jews in the Civil Rights Movement, to hearty enthusiasm. We discussed “On the Map” with innovators who saw its potential for growth. 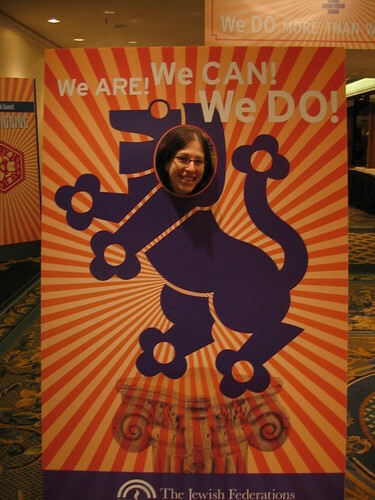 We attended the Jewish Futures conference, where we thoroughly enjoyed presentations from PunkTorah, Media Midrash, and singer/performer Clare Burson. It was gratifying to find readers of Jewesses with Attitude, one of whom is Nancy Kaufman, the soon-to-be new CEO of the National Council for Jewish Women (NCJW). She thanked me for my blog post and gave me a big hug. We’re total BFFs* now. At the International Lion of Judah Conference, Emily (pictured left) and I had the wonderful opportunity to hear Ambassador Gabriela Shalev, Tzipi Livni, Leader of the Opposition in Israel, Shifra Bronznick and Rabbi Joanna Samuels of Advancing Women Professionals and the Jewish Community, and many others. We attended a breakout session led with our long-time colleague and friend Karla Goldman on Hurricane Katrina, the role of Jewish women in rebuilding the NOLA Jewish community, and JWA’s Katrina’s Jewish Voices project. I also attended a session with Gloria Feldt on body image (something we love to discuss here on Jewesses with Attitude) – and after finally meeting Gloria I can say that she is every bit as wonderful in person as I have known her to be online. As Emily and I mingled with the impressive and passionate Lions of Judah, it was exciting to find women who subscribed to This Week in History and our monthly eNews letter. “I am the person who sends the emails!” I would exclaim, excited to turn an organizational email into a personal connection. I met the daughter of Hannah Block (featured in We Remember and who is “On the Map“), who saw her mother’s photo on our “On the Map” poster. We met Susan Citrin of Detroit who raved about a screening of Making Trouble she had organized for her community. Tuesday morning we accompanied the Lions on a service project to deliver a backpack full of books donated by the PJ Library and the Harold Grinspoon Foundation to each student at the New Orleans ReNEW Charter Schools and read with them. Flying home I was struck by all the connections I had made, the potential for partnerships and collaborations, the exciting projects happening around the country and the incredible dedication of so many people working to repair the world. 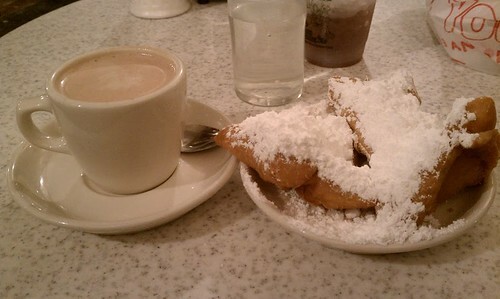 I am lucky to have been a part of this special moment – and not only because of the beignets.